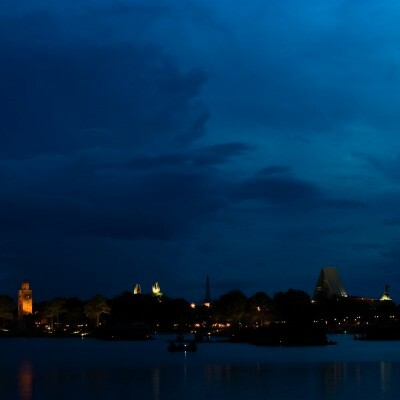 Today we have the pleasure of bringing you a review of The Beer Dinner (formerly known as the Radeberger Beer Dinner) at the 2013 Epcot International Food and Wine Festival from our very special guest author Allison Thayer! 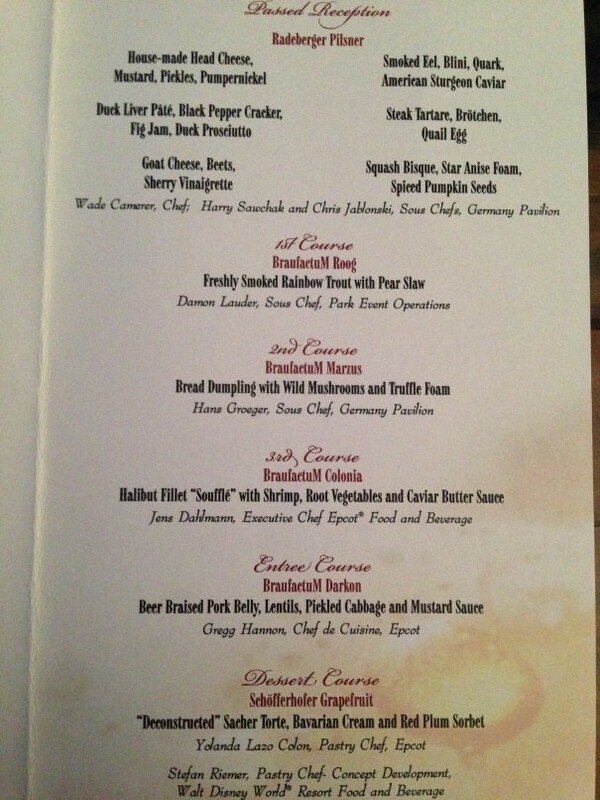 When looking for something different to do during our October trip, I stumbled upon The Beer Dinner. 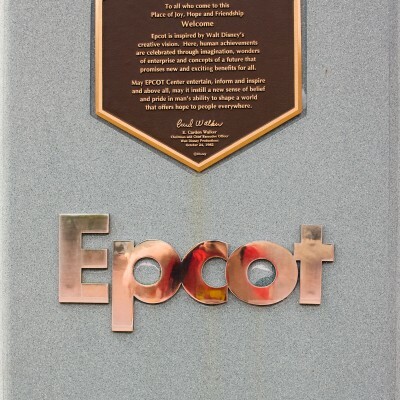 There were no details associated with the title other than the $125/person price tag, so I began to dig for past reviews. Well, I found nothing. 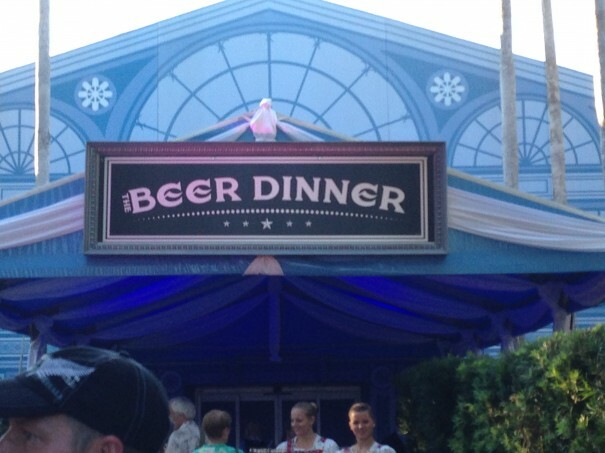 But who doesn’t like beer and dinner? I should preface by saying that I only began drinking beer in the past year, after trying a few brews during the 2012 F&W Festival – while my husband is the beer connoisseur. I had low expectations on the beer front for myself and my husband was nervous dinner would be paired with strong, dark beers. Walking up to the large gate separating England from Canada, we were greeted by a Cast Member where we were given our table assignment. Before we knew it, the gate was opening and everyone waiting was greeted by servers with trays of a light colored beer, in a fancy champagne style glass. “Careful Al, you won’t like this,” my husband whispered to me. I promised myself I’d try each type of beer, so I brushed off his concern. And good thing I did! 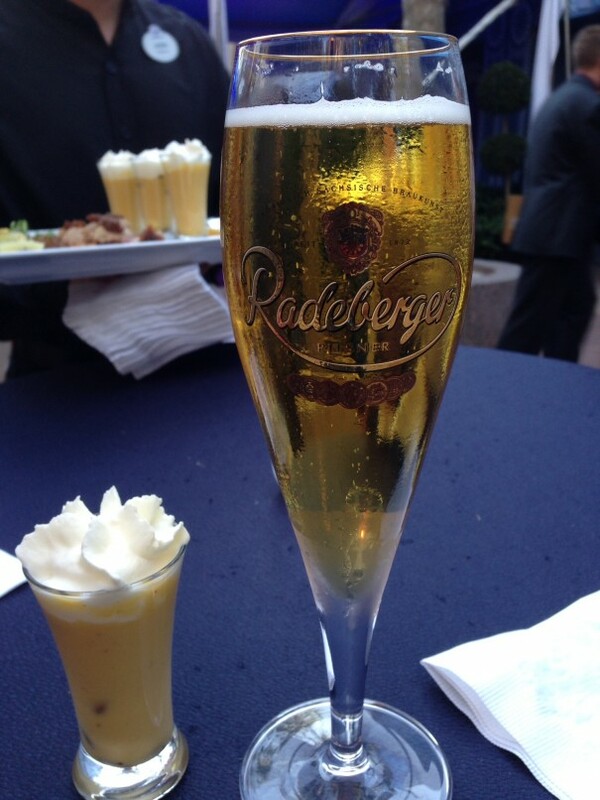 The fancy glass was just for show, and the delicious beer inside was Radeberger Pilsner. 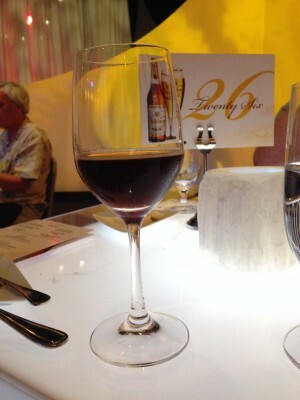 All guests were given the opportunity to have multiple glasses throughout the reception. The hors d’oeuvres were somewhat out of our comfort zone, but we made sure to try each of them. The Squash Bisque was amazing! During the reception we chatted with a couple who had been the year before and they raved about it! Our nerves were slightly calmed by the great things they had to say. 30 minutes later we were all (about 60 total) whisked inside the World ShowPlace. Most tables sat 2, and a few sat groups of 4. While it was nice to sit with my husband and enjoy our dinner, it would have been fun to dine with another couple or two. “Pam” who seemed to be well recognized by many, greeted the room. (If only we could remember her title or last name. Another couple remarked that the festival should be renamed to the Food, Wine & Pam Festival, so she is notably someone special.) Dr. Marc Rauschmann, a Brewmaster for Radeberger, was introduced and spoke about his position with Radeberger and what to expect for the night. 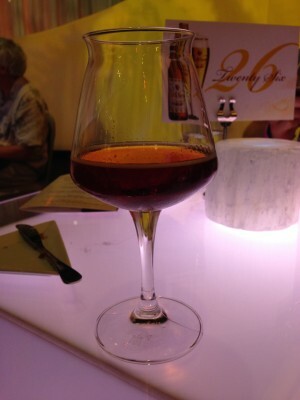 Very wine-like. Based on the number of full glasses removed from tables, this seemed to be the least enjoyed. Looking at the menu, I was beyond thrilled to see food we would both eat! The beers of course were listed in German, and with no description. There were 5 courses, each paired beautifully with a German Beer. As each beer and meal was served, Dr. Marc and the chef spoke about the pairing, describing how they made each selection and why they marry so well. Of the 5 beers served with dinner, 3 of them were fairly dark, yet all had exceptional taste. 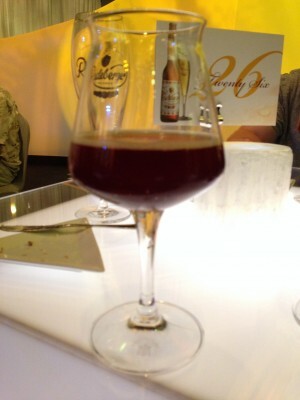 Both of us fell in love with BraufactuM Roog, a smoky, yet surprisingly light brew (despite it’s dark color) that had a small hint of caramel taste. Lesson here – Never judge a beer by its color! 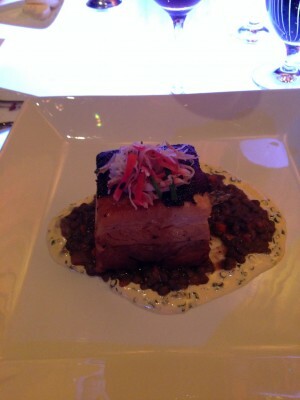 The most delicious Beer Braised Pork Belly! Neither of us left hungry or even thirsty for that matter. 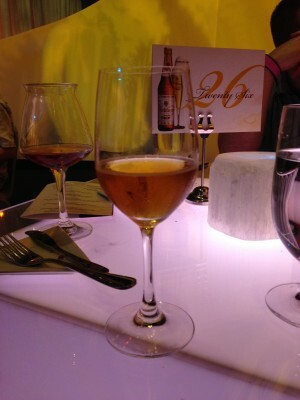 The courses and beers were paired excellently with each other and with the good company. Luckily, over the course of our trip we were able to enjoy most of the brews served at dinner. All but the Marzus and Colonia are available at the Brewer’s Collection outside Germany. 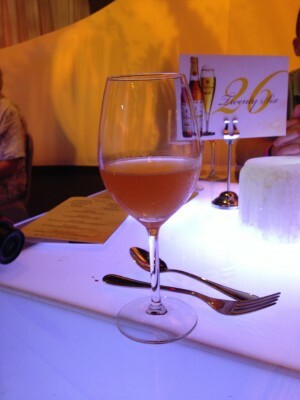 We hope the Beer Dinner returns next year so we can plan our trip around it. Great article. I didn’t even know this place existed! Thanks Al. 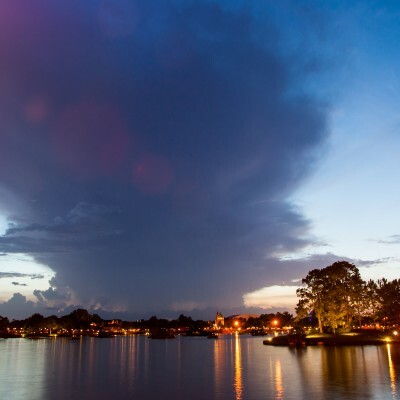 Nice review and pictures – we also attended this event.